South Adelaide remain undefeated at home after beating the Port Adelaide Magpies by 43 points at Hickinbotham Oval on Saturday afternoon. The win extends the Panthers home win streak to seven straight and pushes them back into second position on the ladder, with a record of 8-2. South currently sit a win behind league leaders Sturt, who enjoyed a 27-point victory against Glenelg over the weekend, and a win ahead of this week's matchup, the Eagles. Port Adelaide got off to a running start kicking three majors in the first term to only a single from the Panthers, which came from Josh Trembath. In the second quarter South came out determined to narrow the margin and by the end of half trailed by only two points in a low scoring half of footy. The second half was a different story. The Panthers came out firing and kicked four straight to start the third quarter, led by livewire forward Rigby Barnes, who added three goals to his season total by the game's end. South kicked 10 goals in the second half and allowed only three from the Magpies, with aggressive defense and attack on the footy setting the scene early for South's comeback. Brede Seccull led the disposal count for the Panthers with 24 and sealed the game and his best-on-ground performance with a goal deep into the end of the fourth quarter. Brett Eddy had another consistent performance adding to his Ken Farmer Medal-leading tally with three goals for the game and putting his hand up for Mark of the Year consideration with a screamer at the Colonnades end. Brett currently leads the goal scoring tally for the league with a total of 39 majors for the season, well clear of second placed Mark Evans from Sturt who sits on 28. Check out Brett's hanger below! The weekend was all the more important for South Adelaide as they celebrated their 140-year anniversary since the club's foundation. With the league team wearing unique heritage guernseys that featured the names of every player to play for the Panthers since their inception in 1876 by former South Australian Premier, Charles Cameron Kingston. Xavier Gotch was one of the catalysts for the Panthers, with 20 touches, 9 clearances and a goal for the day. Wearing the 140 years of History Heritage Guernsey, and spurred on by the home crowd South finished the game strong kicking five goals and only a single behind in the fourth. Daniel Bass was effective in the ruck (31 hit outs and 19 disposals) helping South win the clearance battle 39 to 24. Jake Veide and Nick Liddle both had strong performances, setting up team mates for scores multiple times (three score assists each), Jake also finishing the game with a goal of his own. Meanwhile, Tyson Brown was a firm barrier across the half back line, contributing 18 disposals as South Adelaide controlled the possession count with 319 to Port's 282. Back into the side this week was Emmanuel Irra, who was back to his dashing best with 15 uncontested possessions of his 20 disposals and also laying a game-high nine tackles. The Panthers next match is against the third placed Eagles at Maughan Thiem Hyundai Oval at 2:10pm on Saturday the 25th of June. Keep an eye out on the website for the game preview for the exciting away game between the second and third placed sides. In a tight match that went right down to the wire South Adelaide's Reserves enjoyed a thrilling 11-point win against the Port Adelaide Magpies Academy team at Hickinbotham Oval on Saturday. This is the fourth win in a row for the reserves side and increases their season tally to 7- 3. The reserves now sit in a three-way tie for third with Glenelg and North Adelaide - fifth on the ladder on percentage. The match on Saturday against Port was a fierce one. The Panthers got out to a hot and accurate start kicking 9.3 in the first half and led at the major break by 30 points. Guided by strong performances from Joey Haines, who was judged best afield with 22 disposals and two goals and Nathan Daniel (21 touches) the Panthers looked in full control heading into halftime. However, despite the large margin at halftime the Magpies fought back strong in the third term, swinging momentum their way. South's potent offence from the first half died up as they were held to only two points for the quarter while conceding three goals. In the fourth, the Panthers were able to stem the flow by controlling possession of the footy and consistently attack up forward . Despite losing the final term 3.1 to 3.2, South were able to finish the game 11 points in the clear. Jackson McMahon had an exceptional game up forward and left the field with three goals, two scoring assists and nine tackles. Meanwhile, Sam Overall (19 disposals, eight tackles and five inside 50's) played well across the ground, while Tom Jolly was recognized with a best due to his strong defense and Jake Anderson finished with nine tackles in his return to the side. The Panthers won the game thanks to a well-rounded team performance, which saw 11 players record 19 or more touches for the game and South win the overall disposal count by a margin of 89. Despite losing the inside 50's 52-35, the Panthers backline were able to stay strong in defense and convert rebound 50s into good scoring opportunities. This week, South's Reserves will be taking on the first placed Eagles at Maughan Thiem Hyundai Oval at 11:25am on Saturday morning. 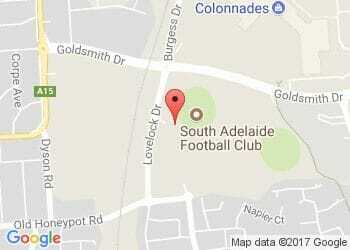 Last time the sides met, South ended Woodville-West Torrens 27-game winning streak.